Sooooo, how did I do? 1. Sort out the piles of stuff on my table. It’s an absolute mess now that I’ve spread out all the stuff I brought back from Caerleon lol DONE! 2. Go through my Caerleon notes. I made lots of notes in Kate Walkers class, so I need to go through them, see if they actually make sense and follow up on some of the authors she recommended. DONE! 5. Sort out a short story to send to Linda Lewis and send it. Linda is doing a critique for me at Swanwick next month. DONE! 7. Write my door piece. lol DONE! 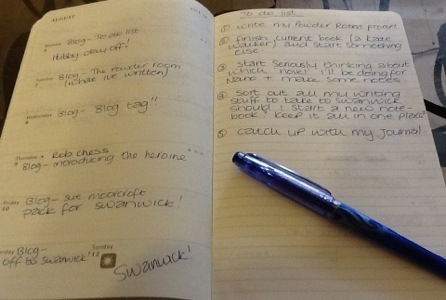 As I’m off to Swanwick on Saturday, the to do list will be rather small this week…..
1. Write my “Powder Room” prompt. 2. Finish current read (Kate Walker) and start something else. 3. Start seriously thinking about which ‘novel’ idea I’ll be doing for Nano and make some notes. 4. Sort out all my writing stuff to take to Swanwick. Should I start a new notebook? Keep it all in one place? 5. Catch up with my journal. There, that shouldn’t be too taxing! 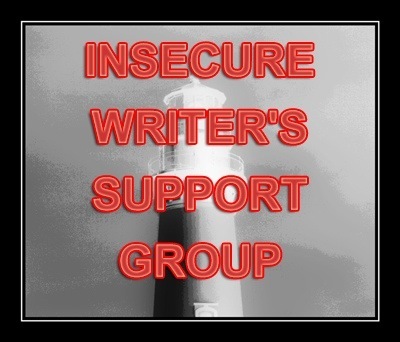 This entry was tagged Goals, Writer, Writer Resources, Writers Resources, Writing, Writing Goals. Bookmark the permalink. My plans have to be worked around my day job 😦 but I have a final edit of my fantasy to do (The Rython Kingdom) and then submit it to Smashwords. Determine which WIP I am going to plunge into once it has gone…and keep up my writing partnership with a friend who lives miles away & feels out of touch. So far it is working well I commited to 1 hour of writing Monday, Wednesday & Friday and she commited to 45 mins Friday & Sunday. I also have work to do on Thursday for my publisher and a writing group meeting on Tuesday. And if possible I want to finish The Map of Time by Felix de Palma as it is gripping. Wow, sounds like you have a busy week!!!! Good luck to you too – my week’s are always busy but I love that. Don’t want to stagnate. School stuff mostly. Inventory and work on my syllabus. I want to write 1k words a day for the novella I’m working on though. Is that a Moleskine planner? If so, you are my hero. If not, I really need to get my eyesight checked. It sounds like you are taking a lot of proper steps to advance your writing career, and while it may be exhausting and time consuming, the time and effort will pay off while others are busy doing something else. I got to do very little (work) last week so my plan for this week is to get some writing done. Hope your list goes well. Hope your feet are feeling better! Oooooo, I love your list honey, good luck! 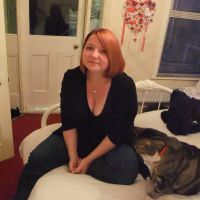 I also thought I’d mention that I’ve nominated you for the Sisterhood of World Bloggers Award! If you accept, please post 7 things about yourself, pass on the award to 7 other bloggers and inform them that they have been nominated. Include the logo of the award on a post or in your blog as well. I’m happy you have a goal list. It is Monday, and mine is shot, but that’s okay. I’m behind on blog reading, too. You provide the inspiration, and I hope you receive an excellent and helpful critique.